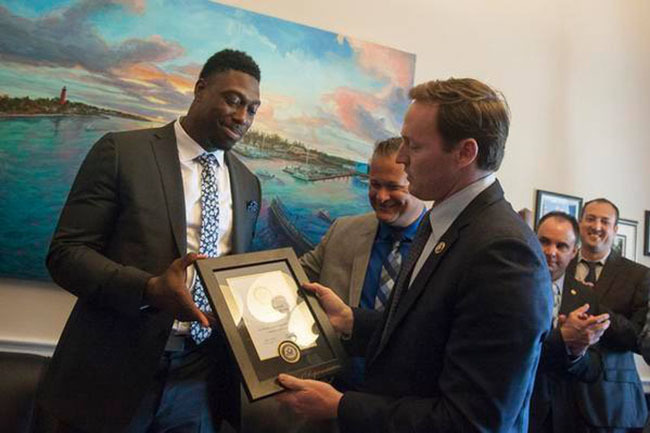 Jared Cook was recognized by Rep. Patrick Murphy (D-Fla.) for his dedication to community service, and for his work with First Step and the Restoring the Village initiative. During National Volunteer Week, we celebrate volunteers who lend their time, talent, voice and support to causes they care about. Their stories inspire others to take action and discover their collective power to unite in making a difference. 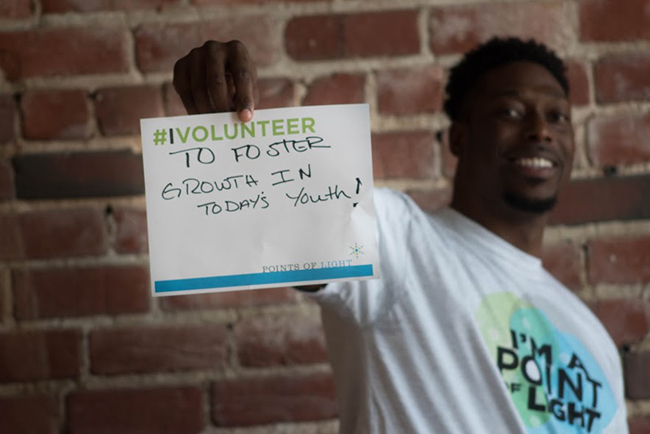 Points of Light is recognizing five NFL players with Daily Point of Light Awards; Competitors on the field, these players unite for a common cause as volunteers with the Van Duzer Foundation’s First Step program – acting as mentors and ambassadors of change. Meet honoree Jared Cook, read his story and nominate an outstanding volunteer, family or organization as a Daily Point of Light. “Our parents used to take us to soup kitchens and donation drives just so that we understood how blessed we were to be in the position that we were in,” Jared said. He was first NFL player to join the First Step Program – an initiative led by Daily Point of Light Award honoree Scott Van Duzer that gives kids and teens the opportunity to engage with community leaders on a regular basis, coming together for casual pick-up games, mentoring and small group discussions on community issues. He is also the recipient of the President's Volunteer Service Award. When Michael Brown was shot in Ferguson, Missouri, Jared – who previously played for the St. Louis Rams – knew he wanted to do something to help the community. Working with First Step, he helped advance the Boy Scouts’ “Restoring the Village” initiative, providing leadership in the community and exposing at-risk youth to new opportunities and a positive path forward. Jared also traveled to Washington, D.C., to meet with representatives for My Brother’s Keeper Alliance, which seeks to expand opportunities for boys and young men of color. In addition to his work with First Step, Jared gives his time in other meaningful ways. Through the Dreambuilders Foundation, he partners with grassroots children’s charities to provide access to funding and support they would not otherwise receive. He received the 2012 Walter Payton Man of the Year nomination for the Tennessee Titans, has been active as ambassador and spokesperson for the Susan G. Komen Foundation, and volunteered with the KidSmart “Push for Pencils” program. As an ambassador for Little Patriots Embraced, Jared helped enhance the lives of military families and children while loved ones were deployed. He is also a recipient of the President’s Volunteer Service Award. Meet the other NFL players honored this week for their commitment to volunteerism and the First Step program: Sam Barrington, Jonathan Meeks, Coty Sensabaugh and Michael Thomas. You can help these Daily Point of Light honorees increase the impact of their work! The First Step program has pitched its creative solution to solving community needs to A Community Thrives, part of the USA Today network. Cast your vote to help First Step win a $100,000 grant to expand the program to neighborhoods across the United States. Vote today!